The Predator was first fielded during the Dark Age of Technology. During this age the Predator was instrumental in establishing Mankind’s dominance upon an untold number of worlds. It is theorised by those with access to the sealed archives that the Predator template was developed in response to Mankind’s earliest contacts with the Ork race. Where the Rhino had served Mankind well in previous conflicts with lesser races, the brutal, close quarters method of warfare favoured by the newly discovered Orks required different tactics altogether. 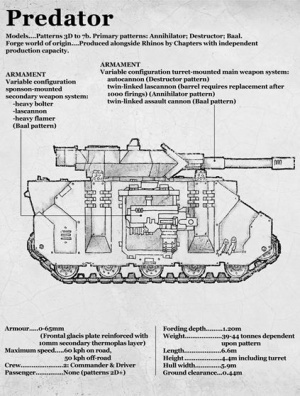 The Predator was an ideal weapon against the Orks, who had few weapons that could penetrate its upgraded armour, and whose own armour offered no protection whatsoever against the tank’s autocannon and heavy bolter armament. The Predators originally employed by the Emperor’s forces were only slightly different to those employed today, and it is a testimony to functionality of the original design that it has changed so little over the course of ten thousand years. The first Predators were equipped with a small passenger-carrying capacity, but during the prolonged campaigns of the Great Crusade it became obvious that this meager facility was of less importance than the ability to carry greater amounts of ammunition, especially if the vehicle in question was to be fitted with side sponsons. 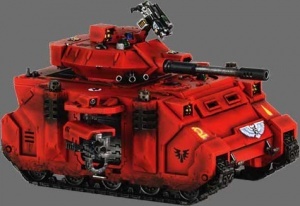 By the time of the Great Crusade, a great number of Standard Template Constructs had been lost, and it was another five millennia before the template for the Razorback, a vehicle dedicated to the role of infantry fighting vehicle, was discovered. In the meantime, Imperial tactics sacrificed transport capacity for firepower, fielding Predators as light support vehicles alongside Rhino armoured personnel carriers. Some Tech-Priests claim that one of the unusual weapon of Predator was a Graviton Cannon, though there are no examples of it exist in the M41 and the ability to re-create it has almost certainly perished. Some Tech-Priest think that once the main auto-loading ammunition feeds were more efficient and able to cycle rounds at a faster rate than the Predator’s systems of M41. Even if it is true, the older pattern of autoloader is long lost, though extant examples are still hidden somewhere and waited for the technology hunters to found them.